Compared to Windows systems the MacOS is much more stable and simple to use, and more Mac users are looking for Mac compatible duplicators than ever before. Printing of labels or mastering CDs or DVDs is inherently simpler on a Mac. Record sales of iPads, iPhones and iPods have introduced more and more users to the Apple Mac OS. With this new growth of Mac professional users, the offerings from the manufacturers of disc publishers has grown with the some exciting new products. 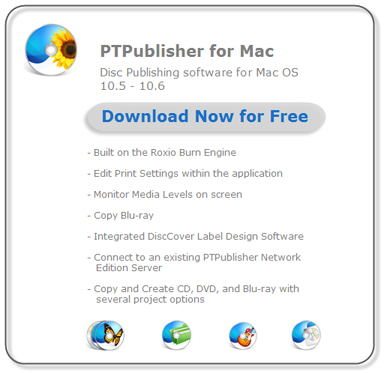 Microboards has introduced PrintWrite Disc Publishing Software for Mac. PrintWrite is an easy-to-use program that operates using an intuitive drag-and-drop method and it is compatible with Mac 10.6 Snow Leopard and 10.7 Lion. The dashboard overview feature shows current ink levels, recent jobs submitted, job status, and more. Rimage has come out with WebQD for MAC, a browser-based interface that allows users to submit jobs to networked Rimage systems using their Mac. Primera Technology offers PTPublisher for Mac. PTPublisher for Mac has an intuitive user interface for multiple job types, including audio, video, data and copy jobs. It has a "wizard style" navigation and has integrated DiscCover™ Label Design software for direct-to-disc publishing. Epson is the latest manufacturer to add Mac support. 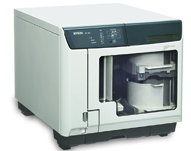 Epson's Total Disc Maker v. 1.01 software allows Mac users to easily integrate popular Epson Discproducer models PP-50, PP-100 and PP-100AP autoprinter for easy, reliable disc printing and publishing. Media Supply understands Mac users want to make discs in a real Mac environment, where users can publish discs on the same Macintosh that their powerful Apple video and audio applications are on. All the items listed below are Mac Compatible, so you can make copies of a Mac CD or Mac DVD right from your Mac OS X system. The re-designed and re-engineered range of Primera 4100 disc publishers is faster, more efficient and more reliable than previous Bravo versions. 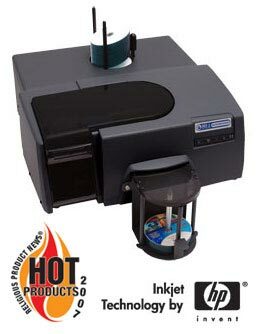 It's the perfect choice for producing quantities of professional-quality burned and printed discs - automatically and hands-free. DiscCover™ (Mac) lets you place photos, backgrounds, text and graphics anywhere on the disc, including as far into the middle of the disc as you wish - a major limitation with other brands of disc publishers. DiscCover™ is a slick and intuitive Mac OS X software to create labels and covers for CDs, DVDs and more. Bravo XR and XRP are Primera's high end duplicators. They burn and print both cds and dvds in full color inkjet from a rugged case that is both stackable and scaleable. Already burn with a duplicating tower? No Problem. All you need is a Primera Autoprinter. The Bravo 4100 Autoprinter will print direct to disc in no time flat resulting in a professional appearance that relieves you of the "sharpie syndrome." Total Disc Maker v. 1.01 software allows Mac users to easily integrate popular Epson Discproducer models PP-50, PP-100 and PP-100AP autoprinter for easy, reliable disc printing and publishing. Of course all of our Standalone Towers are Mac Friendly, requiring no Windows controller or server. Media Supply carries tower DVD & CD publishers from Microboards and Spartan, as well as our own Omnitower line.